The LG G6 has arrived, Speck Presidio cases coming soon! LG just announced its new LG G6 smartphone and Speck’s got the cases to protect it. The new flagship phone has an extra-large screen, a 13-megapixel camera, and a dust- and water-resistant design. According to CNET, LG ditched the modular design of the LG G5 and went with a slimmer design for the LG G6. The screen takes up 80% of the phone, and there are no physical buttons on the front. The phone has a glass front and back, says Engadget, which gives it a sleek look. The phone has two camera lenses on the back, one 13-megapixel and one wide-angle that lets you capture more in a single shot. There’s also a wide angle front-facing camera so you can take selfies with more people in them. The front camera is smart enough to take a photo when it detects a face. The LG G6 comes with Google Assistant built in, which lets you ask questions or look up things on Google. The feature was only available on the Google Pixel phones until now. Other features include wireless charging, a fingerprint sensor, and expandable storage. There’s no firm date on when the phone comes to the US, but BRG says it launches in Korea on March 10. The LG G6 is a beautiful smartphone and Speck has the LG G6 cases to help it stay looking great. Presidio CLEAR shows off the phone’s design and keeps it protected from drops and scratches. 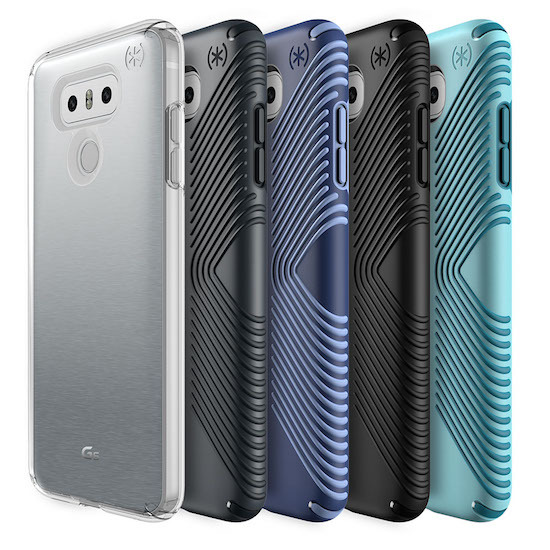 Our Presidio GRIP LG G6 cases come in four colors and help you keep a secure hold on the phone and protect it from drops up to 10 feet. These cases are coming soon on speckproducts.com, and you can sign up now to be notified when they are available.